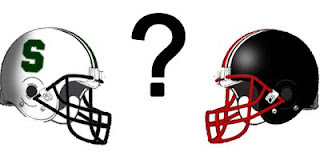 Orrville Red Rider Sports Blog: Football Schedule: Smithville vs. Orrville?? Let's clear up some statements first. Smithville is 22-18 (one playoff appearance, one season of 7+ wins) over the past 4 football seasons. Wadsworth is 30-10 (two playoff appearances, three seasons of 7+ wins) in that same stretch. Hardly a team that's "struggling." If any team has been struggling of late, it's the Green Machine. Back to the original proposal...adding Smithville to our schedule. I guess from a money making stanpoint, it'd be fine. It would make for a lot of pre-game hype and newspaper articles...and would be something the kids from both schools would look forward to....but other than that, I don't think it's something that should happen. I'd take my shot at a team that's averaged almost 8 wins per year than a D-5 school that's barely averaging 5 wins per year over the past 4 seasons. A game against Wadsworth (or Dover) would prepare an Orrville team for the OCC schedule (where 5 of the 8 teams are D1 or D2) moreso than a game against the Smithies would. But I think most sensible fans would agree...there isn't much to gain by Orrville playing any team from the WCAL. It's about as close to a no-win proposition as there is. Win big and we're picking on small county schools.....lose, and it's one of those blemishes that never goes away. Sidebar - Orrville is 47-8-3 against the WCAL (2-0-1 vs. Waynedale, 6-2-1 against Dalton, 9-0 vs. Chippewa, 28-5-1 vs. Rittman, 2-0 vs. Norwayne and 0-1 vs. Northwestern). We only played 2 games against the WCAL since 1962 (a 38-0 win over Rittman in '62 and a 29-0 win over Norwayne in 1981). The Red Riders have never played a game against Smithville or Hillsdale. In follow up with this commenter, he said that he was pretty sure that no contact had been made with Orrville regarding this. That tells me that this is, as of right now, a pipe dream. Would I love to see it happen? Sure. Keith Schrock, approaching the end of his career, going for a career-defining win against Coach Davault and the Red Riders, easily the most successful football program in Wayne County over the decades. The stories would write themselves. It would be a big crowd and well-hyped....but that doesn't necessarily mean it would be a close game. I think at least 8 out of 10 years, Orrville would just have too much all-around talent. Call me arrogant, but what if Orrville and Smithville played in any of the last 3 years? Not pretty. I'd put Smithville's best team up against any of our 20 playoff teams and be more than confident. As of right now, it's just fluff...something for me to write about. I'd take Dover or Wadsworth over Smithville right now...but that's just me. I just think there's more upside in playing Dover or Wadsworth than there is with Smithville right now. I say keep Triway...words that still irk me today were from a speech one of the valedictorians had to say, that beating Orrville twice was the best thing in his highschool career. Let our Riders get them back. Plus the comments I got were pretty rude as I stuck out like a sore thumb in my Orrville shirt. Representing the hometown no matter what school I'm at! Contact has been made now. Waiting on a response from the Riders if anything were to happen. Very surprised that Wadsworth has that recent record. Impressive. An Orrville coach was actually quoted saying "This game needs to happen, the kids would remember it forever, and both schools would make $10,000 from the gate." It is not fair to talk about the past four years. All schools go in dry spells. What about when Smithville was in the State and Regional finals when Orrville was struggling badly in some of Coach Mac's final years? As a Smithie, I agree Orrville would win 7 or 8 out of 10 years, however, I know talent from both schools from high school to elementary and the next 3 years I would almost favor the Smithies, if not expect them to be very competitive. The basketball team plays WCAL schools, why can't the football team? One of the most elite fan bases around and Dover is someone who always gave us good hard strong football games that helped the Riders prepare for OCC. Hands down Dover would be my first pick. If we pick up anyone, Dover by far is hands down the best choice. They are typically a good measuring stick on how the season will go for the Riders. I loved playing at their stadium. They bring great crowds. If we have to play a Wayne County team, it has to be Triway. In my experience Orrville is always chomping at the bit to beat on the Titans, whether it be football, basketball, or baseball. Playing Smithville is pointless, literally. Even though I would like to see it as a fan, it is not worth it. Bring Dover back, always loved playing the Tornadoes as a player and it always went down to the final minutes. I think it not only helps us, but it helps Dover because that league they are in is almost as bad as Genoa's and it hurts them come playoff time. Bring the Tornadoes back Please! On to the WCAL proposal; looks good on paper, but in real life is just irrelevant. Orrville would win 95% of the time, and probably win by double digits 75% of the time. Let's just stick to what we're doing and play bigger schools, we benefit more from it than drawing a big crowd for one game!